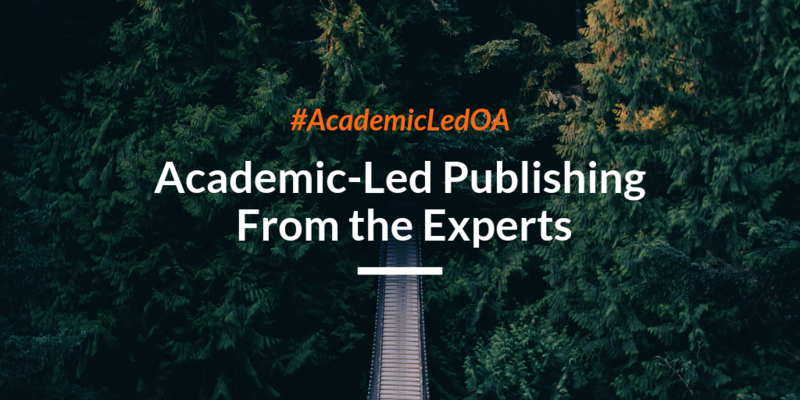 We’re continuing our Academic-Led Publishing From the Experts blog series! In this post we welcome Roxanne Missingham, Chief Scholarly Information Officer at Australian National University (ANU) and Deputy Chair of the Australian Open Access Strategy Group. In the interview below, she discusses open access initiatives at ANU and how she believes Plan S and other OA mandates will encourage academic-led publishing. RM: We are taking a multidimensional approach to OA at ANU at present. To be able to advocate for OA, we have undertaken detailed analytics work to assess the benefits of OA from the scholars’ perspective. Two areas that stand out are in relation to theses and metrics. Theses are extraordinarily deep research outputs, the results of years of work. At ANU we have almost completed digitizing our theses and the results are remarkable. In 2017, 47.3% of research collection downloads were of theses – noting that theses were less than 10% of the titles in this collection. There was an average of 78.6 downloads per thesis, with 87% of users from outside Australia. Promoting these findings to early-career researchers, as well as the increase in citations and scholarly contacts that are made when theses are OA, provides valuable insight into the impact of open access. In terms of metrics, we are collaborating with the academic community to increase registration with ORCID and understanding of bibliometrics. In addition, reporting on the research outputs of the university through the Australian Research Council’s Excellence in Research assessment now includes reporting on the degree to which research outputs are available openly and this is reported to the government and community. Personalizing the results of OA for individual researchers enables a strong and more positive discussion. It also sets the scene to discuss revising our policy environment to enrich our framework to include more data and non-traditional forms of research outputs. What are your recommendations to scholars looking to start an academy-owned journal or flip an existing journal to OA? RM: Establishing a new scholarly journal is a complex area. I encourage those exploring creation of new journals and series to consider who they want to reach, the impact they wish to have, and the business model they’ll use. New journals enrich our disciplines, despite the complexities of setting up and sustaining titles. Scholarly societies have benefited from publishing through encouraging the dissemination of research and thinking, it is not just a business proposition. There are many alternative paths in terms of publishing options – from open access solutions such as OJS which are relatively cost effective to professional publishers such as Wiley and Taylor and Francis. Determining the priorities of the groups establishing the journals is vital for an evaluation of options. With Plan S in play, publishers are exploring options that will make more articles available via open access. The overhead costs of journals must be met in order for the industry and titles to be sustainable. Will payment for each article provide a sustainable solution for all journals? I would think that the answer is probably not, particularly for those communities without a significant financial or technology infrastructure that wish to publish their own journals. Alternatives must include solutions where publishing can be achieved cost effectively for small publishers as well as large publishers. Universities can develop new roles to support innovative, small publishing solutions– indeed one in four university libraries in Australia is publishing original scholarly works in some form (mostly journals). At ANU, we are looking at options that give scholarly communities full control of their publishing, with low overheads and without the administrative burden of managing article publishing charges, but we expect to be challenged and need to explore alternative approaches in the coming year. RM: After decades of advocacy by librarians and researchers to adopt open access and reduce the costs of publishing, this year we have seen a great leap forward in policy from funders through the Plan S approach launched by the European Research Council and major national research agencies and funders from twelve European countries in September. There has been much public discussion, letters of opposition from groups such as chemists, and letters of support. Dr. Danny Kingsley has wisely pointed out that this is in essence a framework and while detailed plans are being launched it will take considerable negotiation to evolve into a well-established practice. I think that the role of libraries in particular is to cooperate in this vision. We have much to give in terms of copyright knowledge to assist in the revision or development of university intellectual property policies that best support open access. That should not, however, be the sole area of innovation. Open educational resources (OERs), particularly textbooks, are a hot topic at present. University libraries are upskilling their staff and developing closer collaboration with departments to promote the benefits of OERs including discoverability, integration into learning approaches, understanding of licenses (particularly creative commons). ANU Press has a fund that provides for grants for the production of OER textbooks and is launching a new languages series. The series is made possible because of the commitment and expertise of the academics teaching languages and the innovative digital education staff in the faculties. We are also seeing the opportunity for innovation in special areas where setting up production would have been unreasonably expensive in a physical-publishing based world. The digital environment allows for innovation in the creative arts. For example, at ANU we are launching a music imprint which will include peer reviewed music and scholarly works in the field. What do you think are the biggest opportunities for academy-owned journal publishing right now? RM: There is a quantum shift happening with Plan S and funder initiated requirements of open access. As this moves to a minimum requirement we will no longer be debating whether material will be openly accessible or not but simply which option will meet the need of any society, group, or individual scholar. It is, quite frankly, about time. Now, of course, the devil is in the detail. Academics and societies need to be informed about options and given support to find the best solutions. At a seminar last week I talked to a number of small societies who are confused and terrified about the complexities now facing them. They have had a stable system for more than a 100 years that has provided revenue using well-established publishers. How can we best help work through this transition? Universities and libraries will continue to publish, as will the publishers we know and love. The greatest tragedy would be for all energy to be used modeling economic issues at the expense of true content and technological innovation. I suggest that we need to increase our knowledge of the nature and process of scholarly publishing, including metrics and software. To be frank, we all need to be able to come up with cost-effective solutions so that our scholars can use those - be they local, national, regional or international - to reach the world with their ideas. This is an opportunity to focus on areas of great concern to scholars and librarians – predatory publishing, lack of quality in too many journals, invisible peer review in a period when academics have less time free for this sort of activity than ever before, unreasonable price increases and delays in publishing that are out of step with the requirements of the modern academe. We must showcase innovation, be willing to invest in new systems and, above all else, librarians must actively continue discussions with authors and publishers.